The 13th Son Average 0.00/5 - out of 0 total votes. Monsters fighting monsters! Monsters eating monsters! Monsters tearing monsters into little monster pieces! From one of comics' best and weirdest talents comes the creepiest new offering from Dark Horse's horror line-The 13th Son. 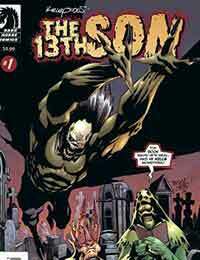 Created, written, and drawn by Kelley Jones, The 13th Son is the story of the world's ultimate monster, how he came to exist, and what this hideous creature has in store for our ill-fated world. Born to a young woman driven to insanity and black magic by the deaths of her previous children, the 13th Son is a creature like nothing this world has seen before. Humans are not his target. It's the other monsters who walk this world-the Wendigo, werewolves, ghouls, zombies, and vampires-who live in fear of his enormous and terrifying powers. And what those powers are setting into motion is a horror beyond your deepest, darkest nightmares.